The Observer participated in the first annual Career Expo held by the East Alabama Workforce Investment Network at Auburn University on Tuesday. Eighth grade students from public and private schools – an estimated 4,000 – from Lee, Russell, Macon, Chambers and Bullock counties participated in the 2-day event. The Expo brought together industry leaders who formed 12 different clusters, and each cluster was made up of several companies. Students were able to tour the Beard-Eaves-Memorial Coliseum and learn about the areas of healthcare, agriculture, law enforcement, construction and more. Observer staff members had a great opportunity to meet others in the communications industry as well as show students what it’s like to work at a newspaper. As a part of our presentation, we gave the students the opportunity to see their picture on the front page of our newspaper. While our mock front page was just for the event, many students asked if we were going to print it. 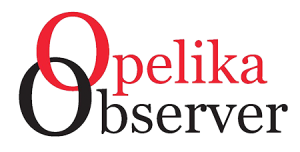 Among the shouts of “I’m going to be famous!” and “Look, I’m on the front page!” we were able to explain the ins and outs of the newspaper industry and what takes place at the Opelika Observer every week. Students asked us how we decide what goes in the paper and if designing a page was hard to learn. We believe it’s of the utmost importance to engage students on a personal level. Eighth graders are at such an impressionable age, and many don’t know how vital the four years of high school will be to their futures. Engaging students on a personal level and sparking their interest in future careers should always be a priority. This event was one of only two of its kind in the state of Alabama, the first one being started in Mobile. Think about how student retention and success could skyrocket in Alabama if more counties imitated what the EAWIN has done. Not only is investing in our students good for them, it’s also good for the community as a whole. Growing industries tend to be drawn to areas that have an active, skilled, career-driven workforce available. For instance, Golden State Foods, a California-based company that will bring 173 jobs and $45 million in capital investment to Opelika in 2016, cited available workforce as a primary reason to open their new facility here. These students are the future leaders of our community; investing in their futures is beneficial for everyone involved. We look forward to participating again next year. Maybe it was the chance for a field trip that put the excitement in the air, but we like to think this interactive event did a lot of good for those 4,000 teenagers.